Boeing (NYSE: BA) and GOL Linhas Aéreas Inteligentes (NYSE: GOL and B3: GOLL4) today celebrated the unveiling of the carrier’s newly outfitted 737 MAX 8 during a celebration in Sao Paulo. The leading Brazilian carrier also announced plans to fly the more fuel-efficient and longer-range 737 airplane on international routes. The first MAX airplanes arriving at GOL are the MAX 8 variant, which seats up to 186 passengers in GOL’s configuration. The airplane will reduce GOL’s fuel use and emissions by 15 percent compared to today’s single-aisle airplanes, and can fly farther than its predecessor. 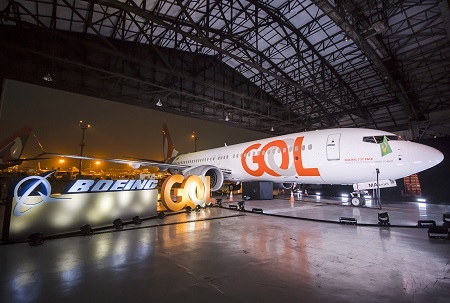 With the additional range, GOL said it will begin regular service from Brazil’s capital Brasilia and Fortaleza to Miami and Orlando. GOL also plans new international routes to Quito, the capital of Ecuador, with the MAX. Thirty of GOL’s new airplanes will be for the larger MAX 10, which will enable GOL to comfortably serve more than 30 additional passengers. GOL and more than 20 customers have placed over 500 orders and commitments for the MAX 10, which will offer operators the lowest cost per seat mile of any commercial aircraft in service. In all, the 737 MAX family has attracted more than 100 customers and nearly 4,700 orders.